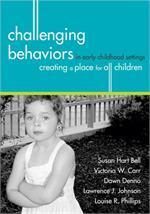 Authors: Dawn M. Denno Ed.D., Victoria Carr Ed.D., Susan Hart Bell Ph.D.
To prevent and resolve common behavior problems in young children, early childhood teachers need a full understanding of what's behind the behaviors and strategies that really work. This complete professional development package gives pre- and in-service educators the practical help they've been waiting for. Taking a "big picture" approach to this critical topic, this book-and-CD set illuminates the diverse influences on challenging behavior—including temperament, preferences, home life, and peer relationships—and arms teachers with the tools they need to create powerful solutions. Going beyond "one size fits all" strategies, this resource empowers teachers to assess their students' specific needs and choose the solutions that will work best. 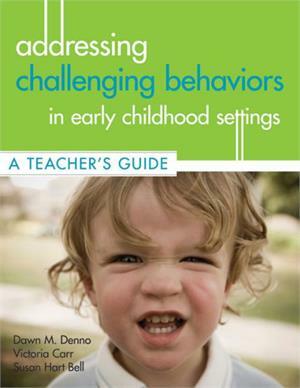 Educators will get more than 60 tools and worksheets—filled-in samples in the book and blank printable versions on the CD-ROM—that help them analyze their current practices, collect information about the child's behavior and temperament, build stronger relationships with parents, and much more. "Exceptional . . . an easy-to-read book with practical strategies that early childhood educators can directly use with children with challenging behaviors." "I absolutely loved the text! 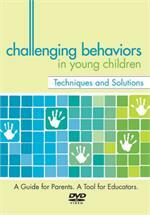 The tools in the book will help teachers prevent, not just address, challenging behaviors." Producer: Grace M. Hanlon M.S.